Dr. Steve Ayers will deliver the sermon with scriptures from Psalms 42 and 43 and Luke 8:26-39. Meredith Farrell is the deacon of the week. She will read the Old Testament scripture and lead the morning prayer. The Men’s Chorus will sing the morning anthem God of Grace and God of Glory. We will receive nominations for deacons today and June 26. Please prayerfully complete the form. The current deacons are listed. Missing your picture for directory? The youth will go to Arkansas July 8-16. The following items are needed: puzzles, beach towels, bags with handles and sunscreen spray 30 or higher. Please bring all donations to the church by June 26. Celebrate America with a benefit concert for Present Age Ministries “Hannah’s House” will be presented by the Piedmont Choral Society on Thursday, June 23, at 7 p.m. at Forest Hill United Methodist Church in Concord. Other concert dates are Friday, June 24 at 7 at Forest Hill and Sunday, June 26, at 3 p.m. at First Baptist Church in Concord. Service personnel and their families will be honored during this all patriotic concert. 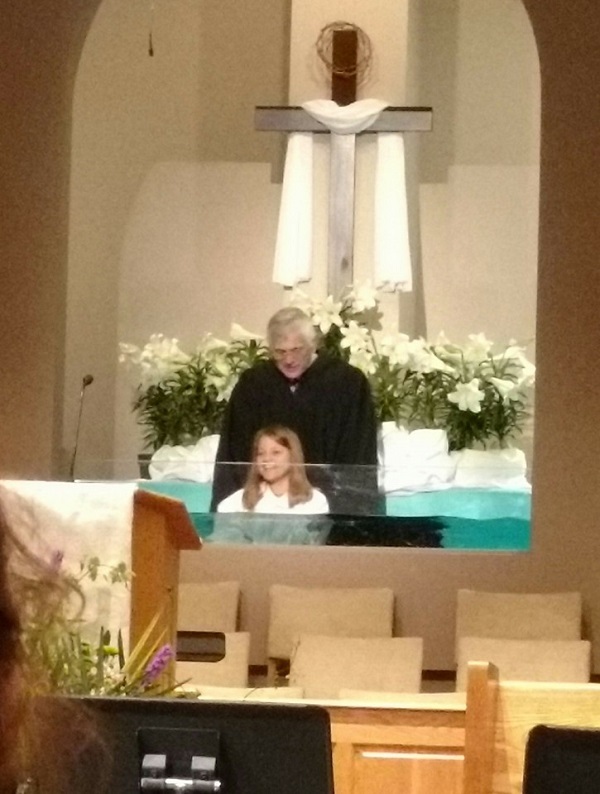 A flashback to Easter Sunday, 2016, and Baptism.